Why a self-taught filmmaker went back to her village in Assam to shoot a film that is making waves in the festival circuit. 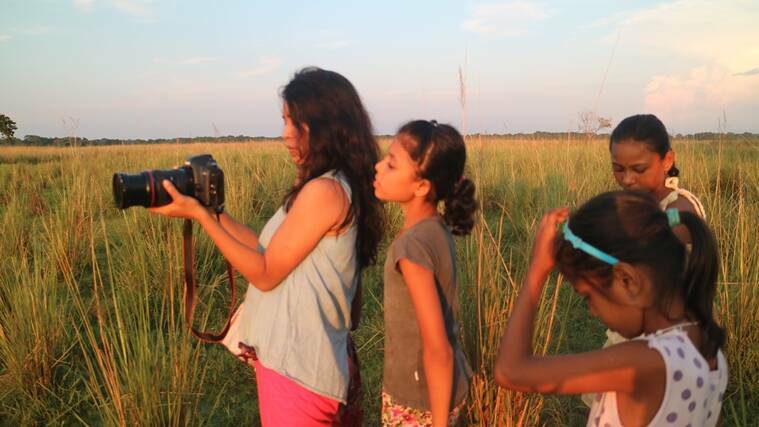 Rima Das with her young cast and crew at the shoot. Rima Das was alone in her cinematic explorations — till some children from Chhaygaon, her village in Assam, came on board. Lugging her Canon 5D, the self-taught Assamese filmmaker was rediscovering her roots in the village, during a break in the making of her first feature film, Man with the Binoculars (2016), when she spotted a bunch of boys at a local gathering impersonating members of a rock band. They were giving a mock performance wielding make-believe musical instruments made of thermocol. Fascinated, Das expressed her desire to make a film with them someday. From that moment on, she became a Pied Piper of sorts as the boys started following her around. There would be others, too. While she was shooting with the boys and experimenting with camera angles and light, her young cousin Bhanita Das would accompany her, observing her keenly. Bhanita reminded Rima of her childhood, when she was labelled a “tomboy”. Eventually, she would cast Bhanita as Dhunu, the 10-year-old protagonist in her second feature film, Village Rockstars, and the boys became her co-actors. The film, set in Chhaygaon, follows Dhunu’s dreams of owning an electric guitar and her coming of age. While the script was developed over three-and-a-half-years, the filming was done in 150 days. Village Rockstars premiered at the Toronto International Film Festival last month to critical appreciation. An authentic cast, unseen locations and organic story-telling came together to create magic in the little moments in the film — a rain-soaked Dhunu, with her head covered in a jaapi, playing her thermocol guitar wrapped in shiny paper in the courtyard of her thatched home; a bunch of children, lost in reverie, as they lounge on the branches of a tree. What’s made critics and cine-lovers marvel is the fact that Rima is almost a one-woman crew who has written, directed, produced, edited and shot the movie. That’s no mean feat, given that Rima has neither gone to a film school nor has she assisted anyone. 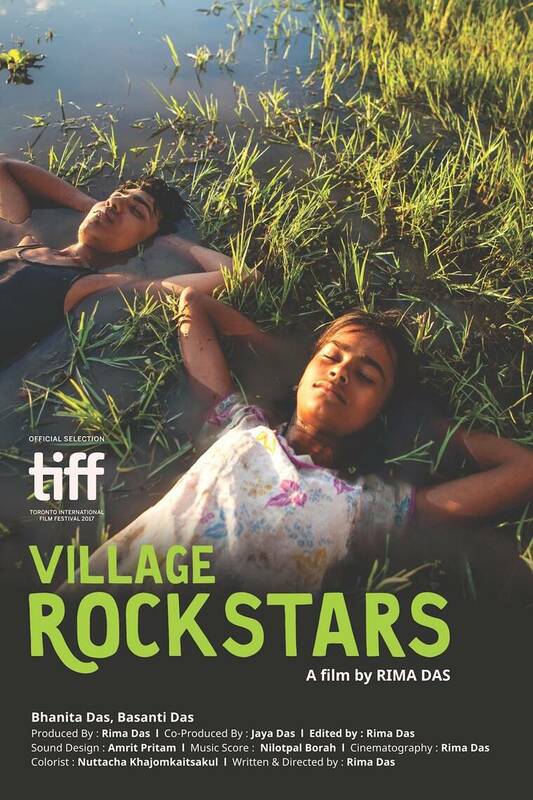 Village Rockstars, which had a European premiere last month at the San Sebastian International Film Festival, was screened under the India Gold section of the ongoing Mumbai Film Festival and is the closing film of the Dharamshala International Film Festival scheduled next month. Rima says she had always wanted to become an actor. That was what brought her to Mumbai in 2003 after finishing her graduation in sociology from Cotton College, Guwahati, and Master’s from Pune University. “I was around six years old when I first acted in a school play. When I moved to Mumbai, I had even cleared the NET examinations. Still, I decided to give acting a shot,” says Rima. During her initial days in Mumbai, she acted in plays, even featuring in an adaptation of Premchand’s Godaan, which was staged at the Prithvi Theatre. Disillusionment followed soon afterwards. Work was hard to come by, even if the auditions were neverending. “During my school and college days, I was always considered to be a good actress. The failure to get acting assignments in Mumbai pushed me into depression. My Hindi and Urdu, too, were a problem. But, in Mumbai, I got exposed to the larger world of cinema. Slowly, my interest shifted to filmmaking,” says Das, whose father is a teacher and mother runs a bookstore and a printing press. With the help of filmmaking videos and articles available on the internet, Das started to educate herself in the art of cinema. She also watched movies by masters of world cinema voraciously. The second major step was to write and direct short films. In 2009, she made her first short film, Pratha. “I made two more short films. Those were primarily meant for my education and experiments with the medium. Throughout, I had always nurtured the ideas that I would eventually make a feature film,” says the 36-year-old, who is inspired by the cinema of masters like Satyajit Ray, Ingmar Bergman, Wong Kar-wai, Majid Majidi and Abbas Kiarostami. In 2016, Rima realised her dreams of making a feature film with Man with the Binoculars, which had a market premiere at Cannes Film Festival and was screened at Mumbai Film Festival last year. The movie about a man in his twilight years reflecting on his life, too, is set in Chhaygaon. Unlike in Village Rockstars, she had a crew to assist her on her debut. Shorn of the paraphernalia associated with a film’s shoot, the making of Village Rockstars has been very organic. Having spent quite a bit on her first film for which her family had pitched in money, Rima was skeptical about hiring a crew. Since she wanted to shoot in her village at different times of the year, capturing rains, flood and other seasons, it would have been a costlier affair, too. “I did not have any storyboard for Village Rockstars. Since there was no crew, I did not use any artificial light. I shot in the magic light — in the morning and afternoon when the sunlight is not harsh. All the actors, barring well-known Assamese actor Kulada Bhattyacharya, who appears as a wise man, are from my village,” says Rima, who found an assistant in another cousin, Mallika Das, a 20-year-old college student. Budgetary constraints apart, the reason for making the movie single-handledly stems from her desire “to make the kind of film I really wanted to”. Her familiarity with village life grounded her cinematic representation. “I knew exactly what I wanted to showcase. It is very difficult to get an editor for an independent film with a small budget. Once an editor told me, editing is not technical but emotional. Ever since, I give more importance to the rhythm — that’s very important while you are writing, painting or making a movie,” says Rima, who spent a lot of time over the last three years in Chhaygaon. “Mumbai is my second home. I have a friend circle in Mumbai with whom I can discuss cinema,” she says. Das has already started working on her next feature, a teenage love story set in Chhaygaon. Once again, she is handling the technicalities with the help of her young actors. The film, however, will also have a mix of professional as well as non-professional actors. “I chose this profession not for the money or the glamour. I want to push boundaries, enjoy the process of filmmaking.” Does that mean her acting ambitions have taken a backseat? “No, I would like to act. Maybe not just now,” she says.